1 of 5 Place corn in a sink full of cold water; weigh down with a heavy bowl; soak 30 minutes. 2 of 5 Meanwhile, heat gas grill to medium-high heat, or charcoal grill to medium-hot coals (mounding slightly on one side). 3 of 5 Transfer soaked corn to heated grill. Grill corn, turning frequently, 20 minutes. If using gas grill, move corn to warming tray. If using charcoal, transfer corn to a large platter and cover with a clean cloth to keep warm. 4 of 5 Tear off six 10-inch-square pieces of foil. Place one flounder fillet in center of one foil square. Season with 1/8 teaspoon of the Old Bay seasoning. 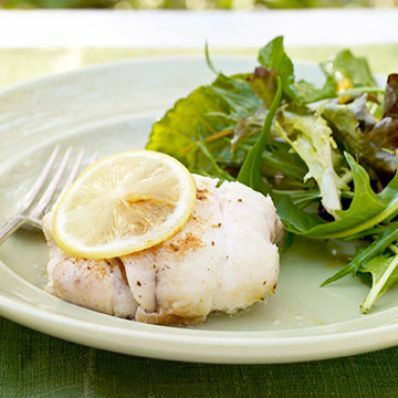 Tuck ends under fillet, top with 1/4 teaspoon of the olive oil and one lemon slice. Seal foil tightly to form packet; repeat with remaining fish, Old Bay, oil and lemon. 5 of 5 Reduce heat to medium on a gas grill. Place fish packets on grill; on charcoal grill, group packets on side with less charcoal. Grill packets 18 to 20 minutes or until fish is white throughout. Serve with corn and butter alongside.